In Bhagavad Gita, neither Krishna nor Arjuna believe that their war is just or reasonable. 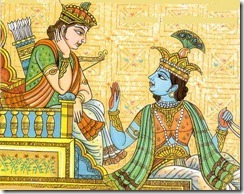 But while Arjuna desists meaningless slaughter, Krishna believes that one must uphold honour regardless of consequence. The two positions represent the alternative moralities. 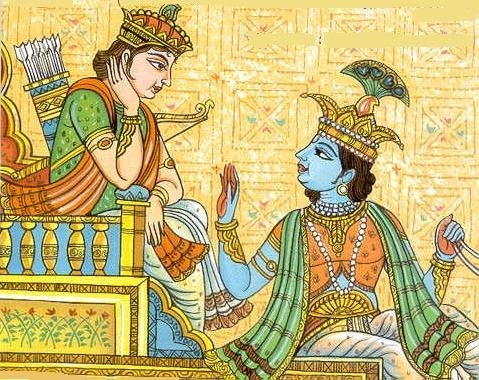 Krishna argues on the basis of principle, its deontology, while Arjuna speaks for the overall impact, its consequential outcome. In Idea of Justice, Amartya Sen identifies these as the alternative poles of justice in Indian thought – the absolute value of niti against the compassionate overview of nyaya. The position of world craft invites a similar division. With urbanisation, many artisans have left their villages and are working in city factories. You’ll find dozens of services in India that will realise your designs–either hand or machine embroidered–by skilled artisans. To the Krishnas, such as development reflects the death of craft. In its authentic guise, craft is tied to a traditional lifestyle, in rhythm with the seasonal and cultural calendar. Constrained by the mechanised time of an urban factory, craft is drained of its essential expression. But to the Arjunas, such factories offer salvation for crafts otherwise facing extinction. Crafts today suffer twin hazards: local markets are replaced by globalised goods and children fail to be attracted to the isolation and drudgery of handmade processes. With the establishment of craft factories, the inevitable drift to cities can at least take craft with it. So who is right? Though Krishna wins out in the end, what’s essential to Bhagavad Gita is the argument itself. Before jumping to conclusions, we need to understand better what is happening inside these factories. Are craft skills being handed down? Is there scope for expression? And on the other hand, rather than blindly following progress, we need to draw a line beyond which products can no longer claim to be hand-crafted. The Code of Practice for Creative Collaborations is designed to cover situations where designers commission products from newly emerged craft factories. It promises to give consumers an opportunity to learn how the work is produced, and producers the scope to increase the value of their goods by extending creative possibilities for the makers.